Yamaha knows there is a huge demand for kid’s/beginner guitars and have managed to grab a big share of this market by producing nice quality small sized models for an affordable price. Say, you are looking for a gift for your kid or your friend’s kid. Getting them a ½ sized guitar is a great idea but the one that comes in a bundle with accessories such as picks, capo, clip-on tuners is even a better idea. The CGS102ALL is a half size guitar. It is perfect for beginners, kids and everyone who wants a traveling guitar or is more comfortable with small guitars. This model has spruce top and meranti back & sides. The neck is made of nato with rosewood fingerboard and bridge. Overall, the quality of tonewood, as expected in its price range, is not top notch but it is quite decent and does its job very well. It is also pretty durable so you will not have to worry about your kid completely destroying it within a week. This guitar is not extremely complicated in hardware and I do not think it needs to be. For a kids’ guitar it does a nice job (a.k.a it is very durable and produces decent sound). This model comes in a bundle with quite a few accessories that you might find very useful. Clip-on tuner, capo, guitar straps, peg winder, legacy picks and pick holder are just a few products in the bundle. This model also ships with Yamaha Folk Guitar Strings that are quite decent. Since this is a beginners’ guitar for kids, as a handy add-on you get instructional DVD, that will help your kid learn playing guitar much easier. The construction of this guitar makes this model have quite a nice sound and warm, well-balanced tone. Most importantly, it is very easy to play. Since it is a beginners/kids guitar I think the ease of playing is very important because unless your kid is a prodigy he probably will not be blasting masterpieces from the get-go. That will only happen if he uses very comfortable and easy to use guitars to develop skills and the CGS102AII is definitely one of them. If you are looking for a gift for a kid this is a great option. With the accessories, you do not have to worry about spending more money and time researching accessories that will be necessary along the way. The tonewood might not be of the highest quality but it gets the job done. This guitar is probably not the best option if you are looking for a long term guitar that your kid will be using for years and years but as a first step it is amazing. 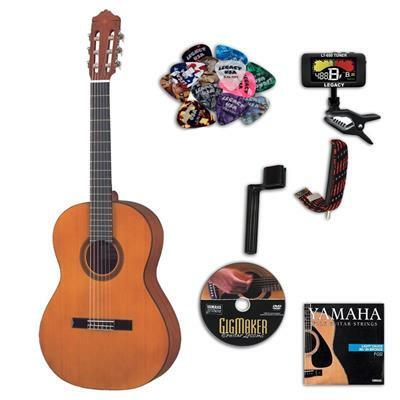 Click here to find out more about Yamaha CGS102AII 1/2 Size Classical Acoustic Guitar Bundle.